United Polaris Business Class, and by that I mean the actual new Polaris seat, is a step in the right direction for United. My 15hr flight from San Francisco to Hong Kong gave me plenty of time to test out the new product. This was a business trip and I was traveling with John. We began the day in Burbank and encountered a two-hour flight delay that wiped out our long layover in SFO. By the time we landed, boarding for our connection to Hong Kong had already begun. I’m just thankful we did not miss the flight! We entered through door 2L to a mid-galley between the forward and rear business class cabin, featuring an attractive Polaris sign and an attractive (faux) marble buffet counter used to offer mid-flight snacks. United uses dark mood lighting in business class onboard the 777-300ER, which looks much better than it photographs. I found my seat on the starboard side. Choose an odd-numbered L seat if you want a true window seat versus even-numbered L seats have an end-table against the window. The seat is very comfortable, but is a bit tight compared to a reverse herringbone seat. On the plus side, the true window seats feel private even without a door. Personal storage space is better than the old business class seats, but still limited. A cabinet to the right or left of your seat offers plenty of room for your mobile phone, passport, wallet, keys, etc. There is also a slot under the monitor that can store a laptop, tablet, or personal reading material. A USB port specifically intended for charging is present below the monitor while the in-seat power and a headphone jack are located near the arm of the seat. A built-in stand on the end of the tray table offers an easy way to prop up your mobile or tablet device. The seat transforms into a fully lie-flat 6’4” bed. That is buttressed by United’s excellent bedding from Saks Fifth Avenue. Note that you’ll find a pillow, light blanket, and comforter on your seat. Request a mattress pad and cooling memory foam gel pillow from the FA as soon as you board, as quantities are limited. The United 777-300 bring something back I have missed on United since the merger with Continental: Live from the Flight Deck. Also known as Channel 9, I love the ability to listen in on ATC communication. Do note that this audio channel is made available at the discretion of the captain. On long-haul journeys, captains will often make it available during the climb out and descent but turn if off for most of the flight. The IFE system contained about a large selection of movies, TV shows, and games. United seems to be unique among world carriers in failing to offer any audio beyond a few audiobooks and a handful of radio stations. United offers noise-cancelling headphones in Polaris Class, but they are not great. Internet was also available onboard. A flight pass cost $36.99. Unfortunately, internet only worked during the first half of the journey, but United is good about issuing refunds when internet doesn’t work. Prior to takeoff, FAs offered a choice of beverage. It was served in a blue plastic glass from economy class, something United just needs to ditch, and also came with a box of two chocolate truffles. There was no wine list offered, though United has started 2018 by listing wines once again on menus. No choice on the appetizer (smoked salmon + cabbage salad) or bread, but I chose the pork tenderloin as the main course. I’ve had this several times in the past and never been disappointed with it. The key is that it still tasted good when well-done. Sure enough, the pork was well-done, but still had a pleasant flavor. This was followed by a cheese course, served with crackers and grapes. United still has not solved its ice cream sundae bowls problem and continues to use white paper cups. It is unacceptable and greatly brings down the quality of an otherwise nicely-presented meal. My eyes lit up when the FA also offered mini pecan-pies for dessert from the petit four selection, but it was mostly dough. But nothing looked appealing, so I asked a FA what was on the “hot bite” menu. Two choices: noodles or a grilled cheese sandwich with tomato soup. I went with the latter and about 15 minutes later it was served piping hot. It was a perfect snack. I fell asleep for a few hours, but did not sleep all that much on this flight due to the midday departure. Despite the evening landing in Hong Kong, breakfast is served prior to landing. I chose a Southwestern omelet over congee and enjoyed it very much. It was served with fruit, yogurt, and a croissant. Sadly, no cinnamon rolls on today’s flight. There’s always debate over whether dinner or breakfast should be served prior to landing on flights to Asia. I think the answer is both, but I do not mind the breakfast…it is always my favorite meal of the day and the spicy Southwestern omelet is always tasty. Just as I was sick on my 18hr flight to Singapore a few weeks prior, John got sick on this one. He had the flu over the weekend (Saturday and Sunday) but woke up feeling significantly better on Monday morning. But even though he only had an ice cream sundae, he spent half the flight in the lavatory. But the FAs took excellent care of him. Unlike my flight, where I was just left alone, they mothered him, constantly bringing water, tea, and warm towels to place on his forehead as well as extra blankets (he was shivering). That’s what I love about United. The service was not polished or particularly friendly, but the FAs proved their worth in the caring way they looked after John. I’d like to see FAs more vigilant in making water runs and checking in on passenger needs, but they were certainly proactive with John. A special-edition United 747 Amenity kit (celebrating the legacy of the 747, which United retired in November 2017) was offered to each passenger. I love the socks! On flights over 12hrs, United offers pajamas (by request). These are comfortable lightweight cotton and I like that the pants have pockets. Slippers were proactively offered to every passenger prior to takeoff with the amenity kits. These slippers are plush and comfortable—the best airline slippers other than on Garuda Indonesia First Class. Lavatories are brightly-colored and more spacious than on the 777-200. Cowshed amenities are available. I was happy to finally try United’s new Polaris Business Class seat. It’s not a game-changer, but is a great step forward and a comfortable seat. Combine United’s great bedding with decent food and wi-fi (at least for parts of the flight) and you have a combo that works well for me. United is not the best…but I’d easily rank it better than SWISS Business Class. Kudos to the FAs as well for taking such good care of sick John. Captains often choose to turn it off after takeoff. The L2 lavatory is absolutely huge, I think its the biggest one for disabled access. I used the lavs on R2 and they were standard sized. Thanks for the review Matthew. 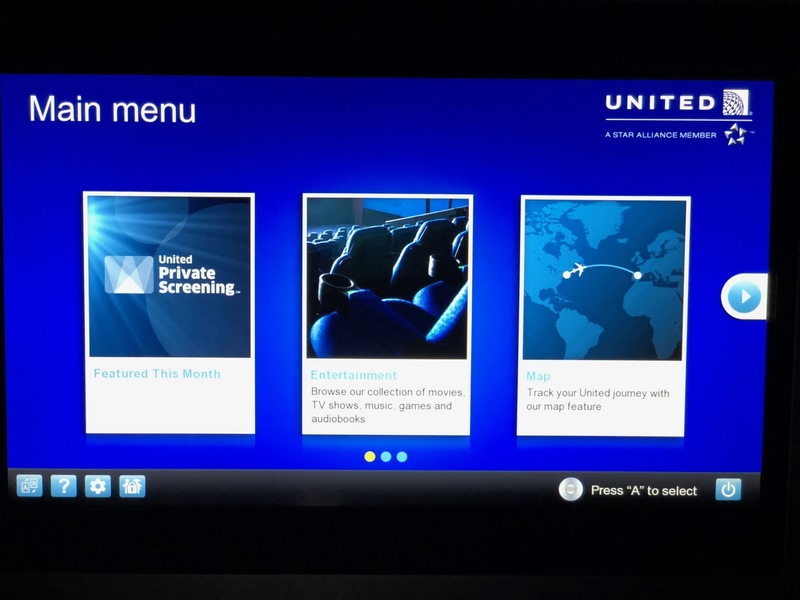 I am admittedly biased as a mostly Oneworld flyer, but I can’t see any specific thing in this review that makes me want to choose United for business class? The seats look sub-par compared with the reverse-herringbone seats (both the CX-licensed and the BE Super-diamond) offered by AA for several years. The food just looks on-par and the service does as well. In addition what percentage of the fleet now has these “actual” Polaris seats? And what premium passenger lounges of note does UA have outside the ORD Polaris lounge ? I just get confused – it doesn’t look terrible but even in the optimal/newest configuration it looks subpar to AA and DL. I’d day the one advantage UA has is your international upgrades will come easier than on AA. At least that has been my experience. A good update, photos on the current state of Polaris service. Agree on ditching the plastic cups, not exactly eco-friendly and tacky to boot. Great amenity kit. Wish UA had bought the 747-8i. 15 hours in that seat is a long time. I flew CX LAX-HKG 777 in F 14 hours and it was comfortable with only 2 in the cabin, but even after 11 hours I was ready to get on the ground. Great report with excellent quality and number of photos. It gives me a good idea of what to expect from the hard product. 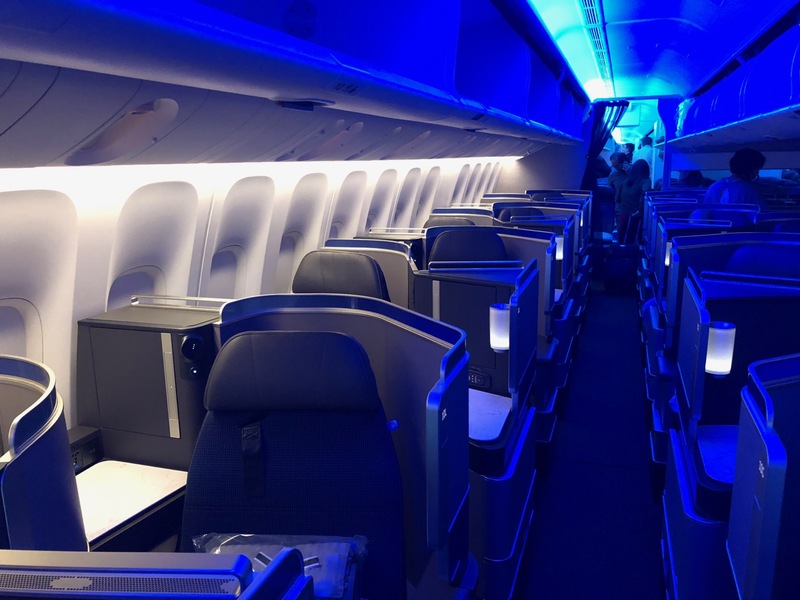 Steve R: agreed on the tackiness, but lets be real: the choice to fly business class to Hong Kong is already so ecologically un-friendly that adding in a plastic cup is negligible. Agree with the LX comment. Swiss is severely overrated and not all their J seats offer direct aisle access. UA has to get their game together in the hardware department, no doubt the new Polaris seats are great and the lounges are a step up, still too few planes and airports have them. 8 across on the 772s are not acceptable, only “cheap” airlines like BA does them. I’m wondering about the usb. On flights, aren’t they always just for charging? You would think so, but on most planes it seems phones don’t really charge when plugged in. But new generation USB ports that add an additional charging symbol rapidly charge phones. I have about 150k miles with United and been really wanting to try Polaris on this route. However, I cannot for the life of me find availability. Every time I try to search really any award space on United.com they offer me the business saver for partners but never on UA metal. Any advice? Thanks! Great article! I have a question — my wife and I currently are in seats 6D and 6G on the SFO to Frankfurt route. We’d rather be in an odd row to be closer together. However, none of those seats are available. There are lots of window seats. Would we be closer with a window seat and a D or G seat or is what we have the best choice since there are no odd D and G seats available? Is there at partition that can go down between seat 6D and 6G? Thanks. Hi Shelley, unfortunately you’ll be rather isolated with either option. I’d move to an even numbered window and aisle seat (G and L), which will put you closest while you wait for the honeymoon seats (DG in odd rows) to open up. Enjoy your trip to Frankfurt! Solo traveller here on SFO-PEK on Polaris. There are no odd-numbered L seats left. I would stick with your current seat.